Ingredients: Water (Aqua), Glycerol, Propylene Glycol, Trehalose, Hyaluronic Acid, Acacia Senegal Gum, Dehydroxanthan Gum, Chondrus Crispus Extract, Hydrolyzed Collagen, Synthetic Fluoro Phlogopite, Phenoxyethanol, Rose Damascena Flower Oil. 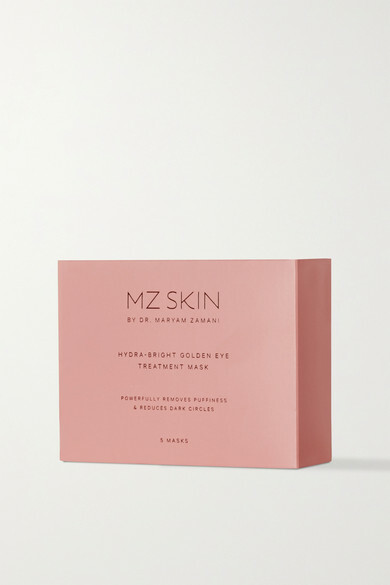 Oculoplastic surgeon and founder of MZ Skin, Dr. Maryam Zamani advises using the 'Hydra-Bright Golden' eye masks on your lower lids to instantly restore radiance and brighten tired skin. Infused with Nano Gold particles to deeply penetrate the delicate area, these gels are supercharged with Collagen, Hyaluronic Acid and Seaweed to improve elasticity, minimize the appearance of fine lines and reduce puffiness. Keep a set in your purse, desk drawer or even car glove compartment to ensure you always have a quick treatment to hand.